Why put up with the deflation of being cut? For Chad Hall, it's the elation of playing the game he loves. KANSAS CITY, Mo. 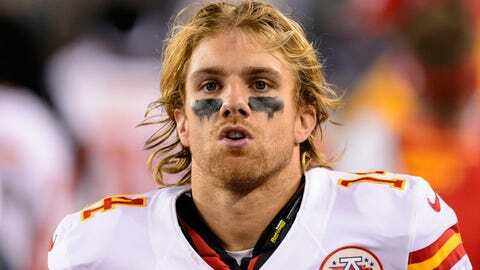 — Chiefs wide receiver Chad Hall knows the drill all too well. His cell phone rings and it’s a team executive on the other end telling him they’re sorry, but they have to let him go. Hall grabs his stuff — just the essentials, he says, starting with his cleats — and heads to the airport to return to his home in Georgia. Once there he waits. And waits. And he hopes he gets a call from some team telling him once more that he can pursue his dream. Hall, 27, says that among stops in Philadelphia, San Francisco and now Kansas City he has been through that drill seven times in the last three years. This season alone, Hall has been signed and cut and re-signed three times. “There are so many great perks to this job,” Hall says, quietly. “You get great pay doing a job you love. But Hall won’t quit on his dream. Though short in stature (5 feet 8), Hall always was a gifted all-around athlete growing up in Norcross, Ga. He played quarterback in high school and as talented as he was, he wasn’t recruited heavily because of his size. The Air Force Academy was willing to recruit him as a quarterback, but then quickly switched him to running back and slot receiver. It was there that Hall excelled in the Air Force option offense that featured jet sweeps, reverses and quick pitches — plays designed to stay away from the big bodies inside. Hall rushed for over 2,600 yards in three years at Air Force, averaging 5.8 yards per carry. Yet he went undrafted by the NFL in 2008, and after a couple of brief tryouts, he went on to serve his two years of military commitment without knowing if any team would want him after that. But in March 2010, Hall found a taker in Andy Reid and the Philadelphia Eagles. He signed a three-year deal but was cut before the opening game that season. That’s when Hall’s release/re-sign odyssey began. Hall was re-signed by Reid and hung on for two seasons with the Eagles, catching 10 passes for 107 yards, before he was finally let go for good in 2012. Last year, he spent almost the entire season on the 49ers’ practice squad before being let go in January. When Reid came to Kansas City, Hall found a home again. Sort of. Still, it hasn’t been easy getting released so many times. Almost every time he has been released, the phone conversation is the same: We’re sorry, we have to let you go, but stay close to your phone. In the case of the Chiefs, for whom he has one catch for nine yards, the sentiment of those calls has been sincere so far. They have brought him back each time after cutting him, and one time they virtually promised him he would be back. “The last time I got released was on a Saturday and they said, ‘We will bring you back Monday,’ ” Hall recalls. “But then it didn’t happen right away because (tight end Anthony) Fasano (was hurt) and they needed an extra tight end. Hall knows it can be a cruel business and he doesn’t expect any soothing therapy from the voice telling him he has been let go. Through each time he’s been cut, he dutifully collects the few items he keeps in his locker stall and heads out, back to the airport and back to Georgia. There’s really no one to confide in. But even with those positive thoughts, Hall can’t help but worry that each time his cell phone rings, his dream might end.